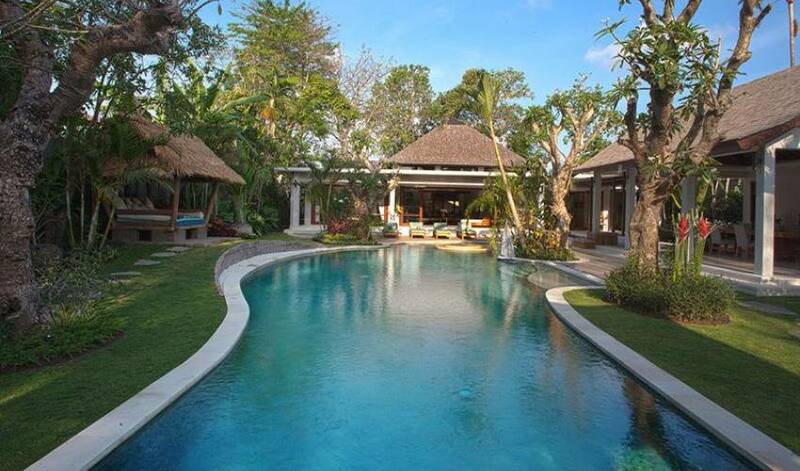 The villa comprises a series of single-storey pavilions linked by covered walkways, terraces and private gardens, and arranged around three sides of a 25-metre free-form swimming pool. Closest to the entrance is the open-sided dining pavilion, with doors to the professional service kitchen and guest washroom behind. 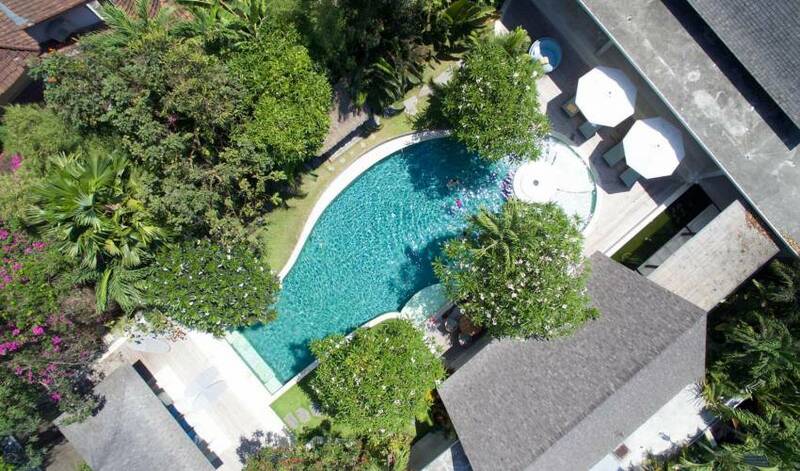 To one side is the main pavilion housing the living room, media room and guest bedroom opening onto a covered poolside terrace and, in a private pavilion separated by koi ponds, the master bedroom, guest bedroom and a kitchenette. 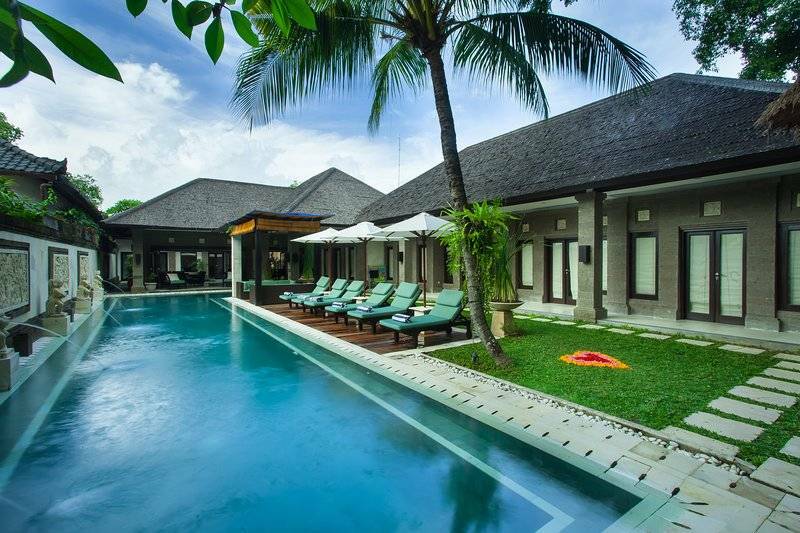 At the opposite end of the pool is a heritage joglo pavilion that serves as an events space, plus two more guest bedrooms. Cascading from the vaulted roof and sparkling in the sunshine streaming through the skylight, a chic contemporary chandelier sets the tone for the villa’s elegant living room. 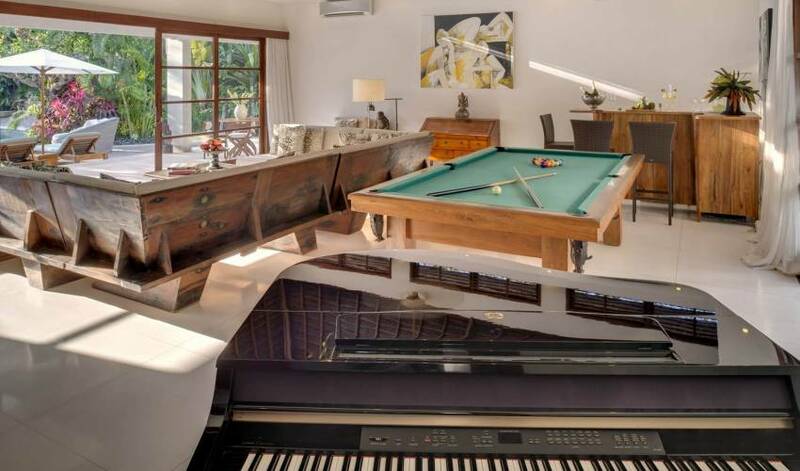 Below, a baby grand piano and a pool table rest on the oriental-rug-strewn floor, alongside sofas and stylish daybeds. 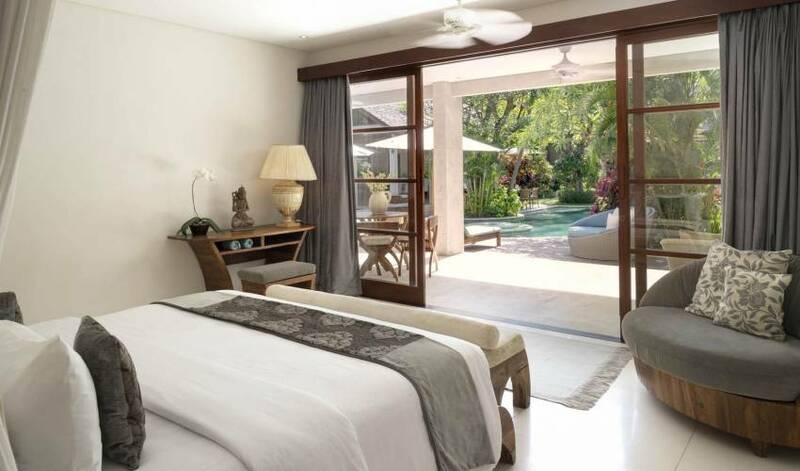 Two walls of glass doors slide back for tropical fan-cooled living or can be closed for air-conditioned comfort. 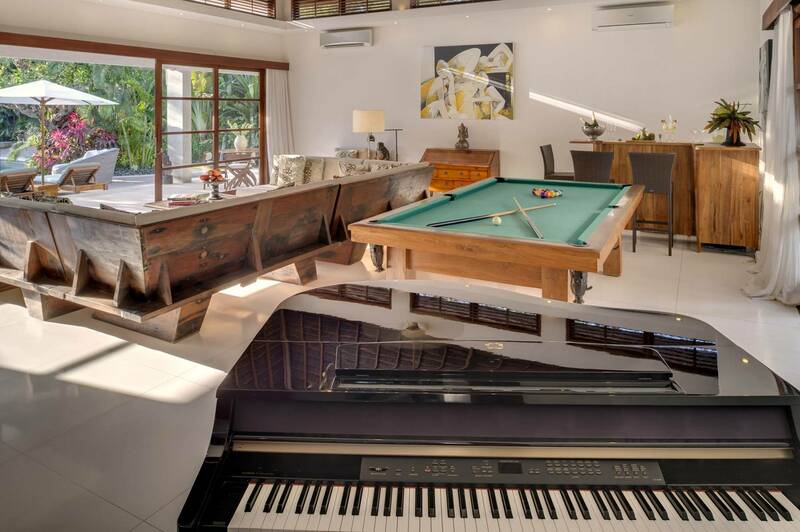 Opening onto a broad covered terrace just above the pool deck, the living room is perfect for entertaining. Linked to the living room is the air-conditioned media room. Here, the massive sofas and chaise longuescreate the perfect conditions for reclining in supreme comfort while watching a film on the 51-inch flat-screen TV (complete with Bose surround-sound and Blu-ray disc player). There’s a library of over a thousand DVDs to choose from, as well as an excellent selection of books. The dining pavilion is dominated by a 4.5-metre-long, 16-seater table crafted from a single slab of solid wood. Open on three sides to the pool deck, and with a vaulted wood-lined roof soaring above a terrazzo floor, the pavilion is cooled by natural breezes and ceiling fans and soothed by the sound of water trickling from fountains in the adjacent pond. Alongside, yet out of sight, is a professionally equipped commercial kitchen – the domain of the villa estate’s three chefs. Presiding at the head of the pool is another open-sided seating area formed from the ornately carved four-pillar core of a 100-year-old joglo that sits on a raised ironwood deck. 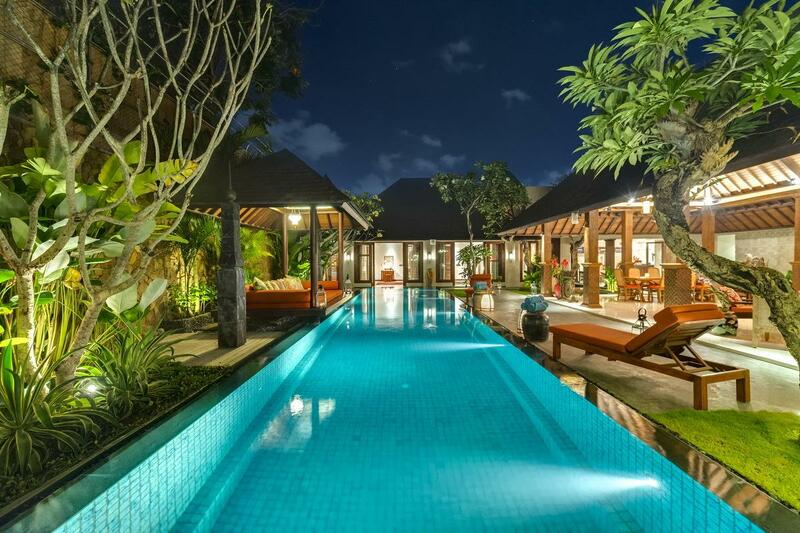 This heritage teakwood structure from Java with its distinctive trapezium-shaped roof serves as a romantic wedding pavilion, or a star-lit dining area. A separate awning can be attached to cover the entire deck. 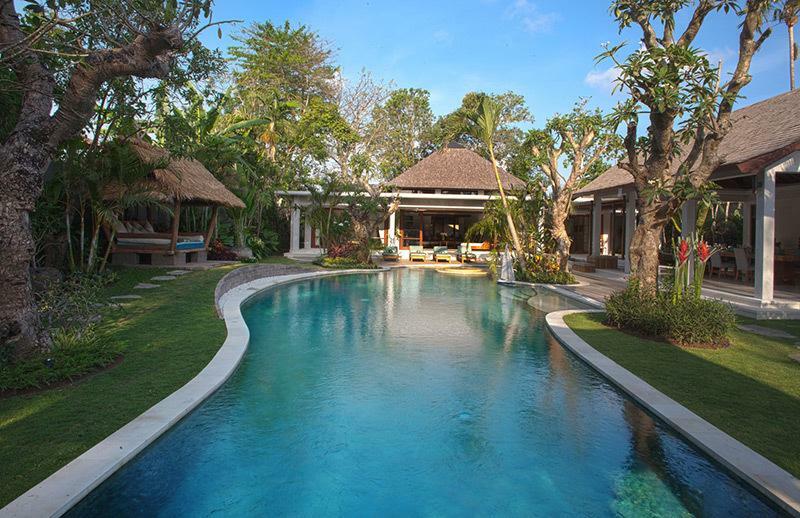 There’s plenty of outdoor living space at here too: a traditional Indonesian grass-roofed pondok (rice shelter) serves as a poolside balé, providing a shaded alternative to the pool deck or the submerged seating at both ends of the pool. Parasol-shaded sun loungers dot the ironwood deck, while swing seats and clusters of casual seating on shaded terraces create further options for relaxation. The villa’s five bedrooms are beautifully designed with individual colour schemes and covetable furniture crafted from the hull of a traditional phinisi boat. All have comfy beds, cable TVs (31-inch or 43-inch) with Blu-ray disc players, and a choice of air-conditioning or overhead fan. Large, light-filled bathrooms with non-slip acid-washed marble floors, twin basins, rain showers and terrazzo bathtubs look onto private courtyard gardens. 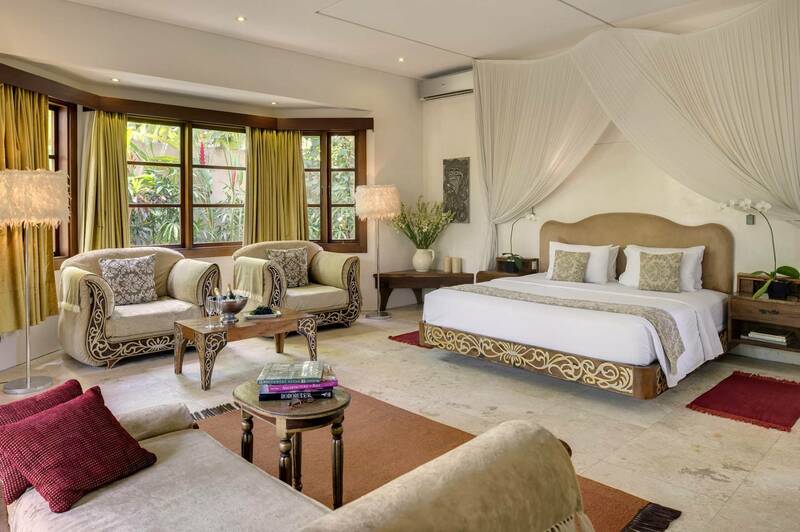 Positioned for complete privacy, the master bedroom suite features opulent furniture set on a burnished teakwood floor. 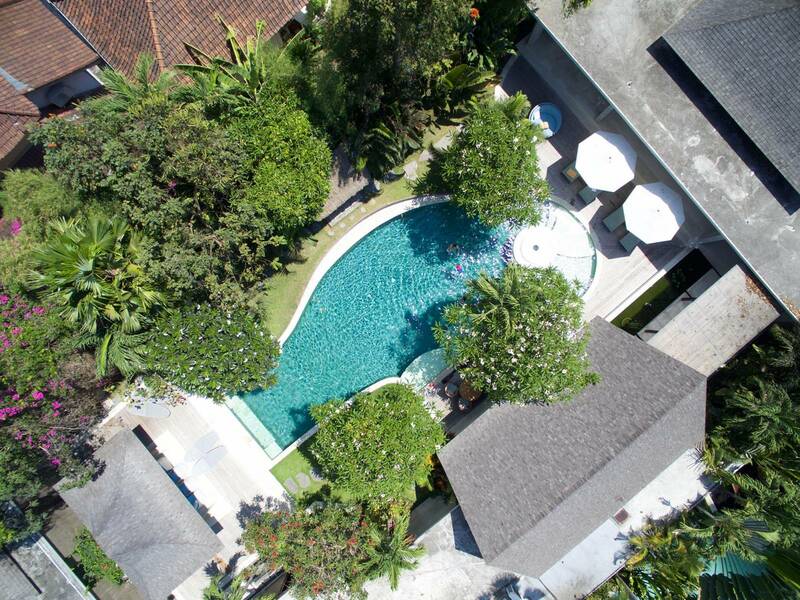 The imposing king-size bed, together with a selection of comfortable seating areas, is oriented towards a private walled garden surrounding a towering tropical tree. There’s another garden off the huge ensuite bathroom – a glamorous space with dressing area, upholstered seats, screened bathtub and both indoor and outdoor showers. 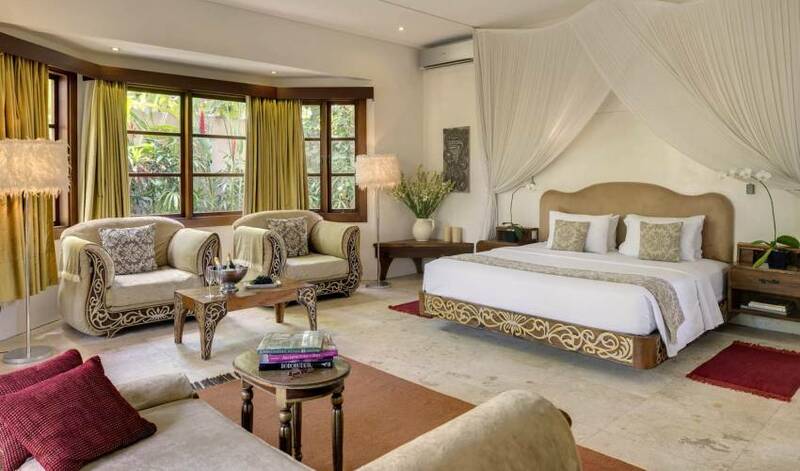 Also in the master pavilion is a king-bedded guest suite – perfect for a family with young children. A door connects its large garden bathroom to the master bathroom. The pool-view guest suite in the main pavilion has sliding doors onto covered terraces facing the pool on one side and a koi pond on the other. Like the master suite, its king-size bed has clever mosquito netting, creating four-poster intimacy or retracting to open up the space. 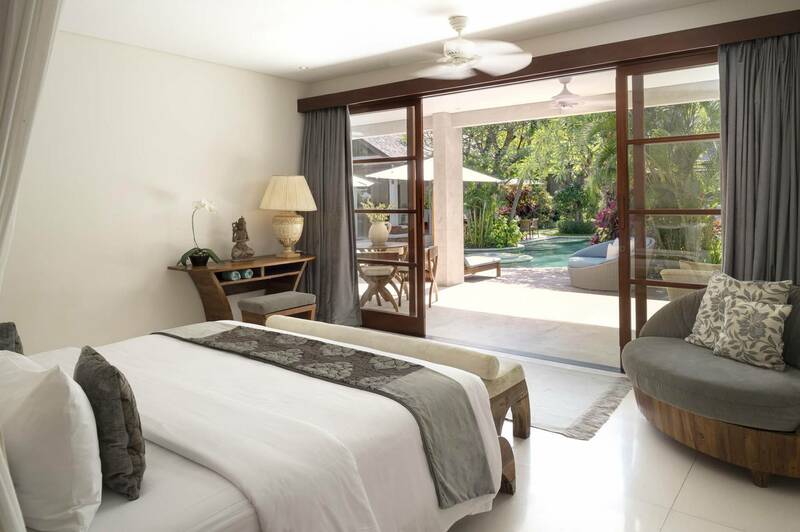 Privately screened by a garden wall, the guest pavilion features two bedroom suites, each with its own entrance, beds that can be configured as a king or twins, and a delightful bathroom with a dressing room and a wall of glass onto a courtyard garden framing an alfresco shower area.